Extending an extra-long reach, this lotion applicator rolling massager helps you cleanse, moisturize and massage, without straining or twisting. Simply fill the long handled lotion applicator with lotion, sunscreen, pain relief cream, or oil, and the 19 rotating balls on this body lotion applicator massage into hard-to-reach areas, so you can use it as a lotion applicator for back dryness. 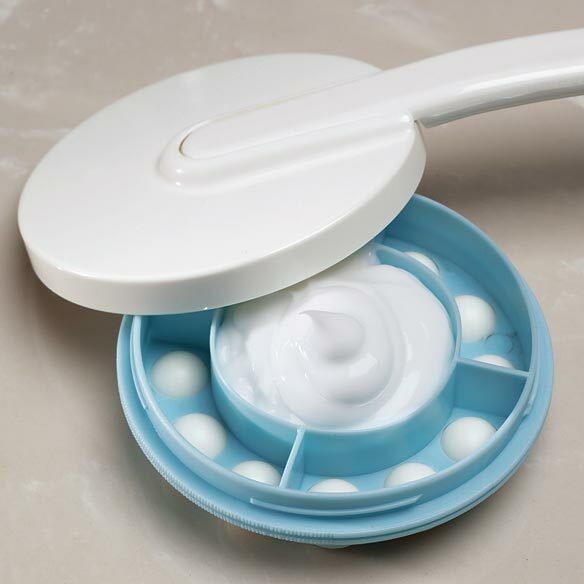 Our moisturizer applicator has a screw-on cover that prevents spills. Polypropylene with removable handle. 18"L, 4"W head. This product is wonderful! It has helped my husban be able to not have such dry skin and his itchy back is no more. The itching use to get him up at night not any more. Will be purchasing thesefor gifts! I love my bath lotion applicator. It is great!!!!! I use the product to put lotion on my back. I had an incredible itch on my back. After purchasing the applicator I do not have to rely on others for help. I simply fill and use, its easy to use and it works. No more itch. Made very well. Easy to use. This product is great! I have no problems now getting my lotion on my back but use it all over. Would definitely recommend this item! This is wonderful for putting lotion in those hard to reach spots. It's easy to carry in your suitcase because the handle is detachable and the cover allows you to not have to empty it when traveling. Reaches places on my back that I can't reach! I have problems with dry skin on my back but don't have anyone to help me put cream on it to help with the itching. With the lotion applicator I can get the lotion on myself without waste or mess. I use the applicator every day. This lotion dispenser is great. enables me to out lotion on my back easily and the long handle is perfect for reaching my back and legs. Bought one for a friend who also thinks it is a great product. I use this applicator to apply lotion to my back. I like mine so well that I ordered 5 for stocking stuffers for our daughters. I have post shingles itching which I've had for years. The effected area is on my back and the itching can be intense. This product, using an anti-itch cream, makes all the difference. I can relieve my itching almost immediately. Without it, I would literally be stuck unless someone was available to apply the lotion. Love it. Works really well. Should have had one long ago.!!! Really feels great when I use it. Relaxing. Feel cleaner. Our whole family loves this product! I have bought 4 of these and given them as gifts and they love it! Great Applicator for applying lotion. The only product I have found to apply lotion to hard to reach areas i.e. back, shoulders, etc. Love this product > I will buy it again !! It is easy to use and clean! It is easy to refill wit lotion! This is a great product for anyone who lives alone or those who don't want to depend on someone else. I bought this for my elderly mother and it works great! As we age we hate to call on loved ones to rub us with lotion, or least I do, but this applicator removes that problem. It is easy to add the lotion, and reach all the hard places I can't reach any more, back of legs, small of the back,and my shoulders. It makes me feel spoiled! I LOVE MY APPLICATOR! This product is great and very easy to use. I've seen this for quite awhile, and not gotten it due to a lot of the negetive comments. But....so far I've had no issues with it, and I've used it a lot. It doesn't blob the lotion on, it puts on a thin coat. If you need more... add more, just like if someone was actually applying it. 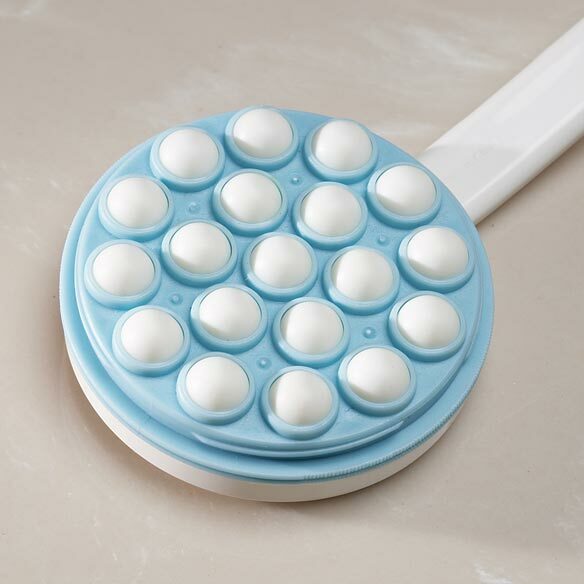 The roller balls are smooth and do not scratch, which is great if you happen to have a sunburn or very sensitive skin. I have a lot of nerve ending issues, and this item is great. Treat this item carefully, don't man handle it (no offense), and it will last. It's not a back scratcher. I'd ordered two of them (one for myself and the other for my mother), and I'm going to order two more as I know my friends will just love them. Treat yourself to this "Luxury" item. Your back will love you for it. I bought this specifically because I have arthritis, and it is difficult to reach my back with lotion. This product is a great help. My mother is a semi-invalid and lives with me, she uses it and loves the way it works. It is easy to use and works well. I have a new appreciation for Miles Kimball ! I ordered this lotion applicator and got it quickly. It is just what I've been searching for, the positive reviews assured me to try it and I'm so glad I did ! Thank you so much for the wonderful product !! An awesome invention. I have given This to 3 friends! It is great to have something to apply lotion to the back. My skin gets so dry in the winter months and now I am able to cover that area. I have bought one for a friend that I will be giving as a gift. I have a bum shoulder presently, so I ordered this gadget to apply lotion to my back. I never thought it would work so well. The rolling balls deliver just the right amount of body lotion--no lumps of lotion--just a smooth application. The covering keeps everything sanitary. Praises to the inventor!!! This product is great when you are alone. Wish I had ordered it sooner. I would buy this product for gifts.. This is a great product..easy to use and you can get to hard to reach places. This product is great and works for me. I have very dry skin & swim 3 times a week, my doctor suggest putting lotion on right after getting out of the pool & shower. This applicater works great on my back and my dry skin has improved. I bought this to apply lotion on my back and when my daughter came over for a visit I showed it to her and she loved the idea of how it works so I purchased another one for her and she loves it too. I have trouble reaching and my back is something I cannot reach well. I need to clean, lotion and sun screen. This product is super and is all I expected it to be. is very good and it work for me. i love it,and am going to get one more. Not everyone has a "significant other"
This is one of the most useful "gadgets" I have ever had. When there isn't a "significant other" to apply lotion, etc. to your back, this applicator does the trick. It doesn't leak, the rollers distribute lotion evenly and it feels great! I will be giving this product as gifts to friends and family. Love it! It is the best I've found! I need to use back lotion and most have a foam pad glued on and it will fall off easily. Must be replaced often. This you can clean ever so often and continue to use. It also doesn't waste expensive lotion. My patients love this lotion applicator. I am a rehabilitation therapist and teach ways for patients to do things independently. My patients love these lotion applicators and want them for friends. I've researched several long handled lotion applicators and this beats the others by a long shot. You also have the best price. I would buy this product and use it as long as needed. Refills and works easily. I like it. This is a nice, easy to use item. I bought it for my husband who has a real problem with dryness in the winter. This has made getting to those places on the back easier. I will always have one! This product is great for putting lotion on my back. My skin gets very dry in the winter and now I don't have to bother my husband to keep putting moisturizer on my back. As the cold weather gets here so does dry itchy skin. This is the perfect item to get that lotion to the places you can't reach. This product really works. I find that the thicker lotion only puts a thin layer on your skin, but a lighter lotion works better for me, putting more lotion on my skin. I gave this to my mom because her prior lotion applicator wore out. She loves it. The little roller balls distribute the lotion evenly without leaving big globs in unreachable places, and the handle is long and curved so she can easily reach all the dry spots on her back. Plus the little roller balls feel good rubbing her back while she is applying the lotion -- like a back scratcher, but in a good way. It is wonderful.I use it on myself and my husband.We both just love it. I use this everyday. Does very well applying lotion. It worked well with body lotion, but had trouble using with baby oil. With oil it dripped and was not contained within the unit. Can you lotion your own back? Mostly for application of lotion to back, unreachable areas. It's a great product. However, after several uses, the little ball massagers, fall out. That's my only complaint. I was forced to purchase it again. Even though it works well, I will not purchase a third time. I hope this one works for a long time. Love to use this after my shower to apply lotion to my back. It is also quick to use. I GOT THIS DUE TO HAVING SHOUDLER SURGERY AND IT WAS AND IS GOOD. I ALSO GOT THE BRUSH. DUE TO THESE I COULD GIVE MYSELF MY OWN BATH INSTEAD OF HAVING TO DEPEND ON MY HUSBAND TO DO IT. A LIFE SAVER FOR ME AS I'M A INDEPENDENT WOMAN. I use this applicator with my regular body lotion every day, and just bought a second one to apply sunscreen when summer arrives. It accomplishes what I needed: relieving the constantly itchy (and painfully scratched, by me) skin on my back. Works great! It is lightweight plastic and I don't know how long it will hold up, but then it is quite inexpensive. It's easy to use, comfortable to hold, and reaches where it needs to. back and cannot reach to lotion it. This works great! I purchased this exact device at an expensive store. It works perfectly to apply lotion to my back. It isn't the most durable of products, but it works so well that I am willing to perchase it again in the future, especially at Miles Kimball's price. I use this for lotion every day. Thinner ones work better than thick products. After many years of use the threading got stripped, but if I'm careful I can still close it properly. I've dropped this a bunch of times and only cracked the cover, not the actually applicator. For that spot you can't reach! Great for that spot you can't reach! I am a widow and need the ability to soothe those areas in the middle of my back! Whether after a shower or anytime of day. It is however, easy to break if dropped - that's why I bought a spare! I have excessively dry skin on my back. This product helps reach those dry, itchy spots that I cannot ordinarily reach to apply lotion. What a relief to be able to apply lotion when I am by myself and when I want to. I need to apply lotion on my back all the time, I just find it is very handy, and easy to use, and the applicator do his job. around, the sides, scratch just a little bit, when you use it(the sides), not a big deal. Works as described. Had no issues with durability. Only thing I don't like is that the lotion tends to bunch up in one spot inside the applicator and you need to even it out more. I bought this as I had a couple of hard to reach places when it came to applying lotion. I was a little skeptical, but pleasantly surprised. It has a container that holds lotion and a lot of little balls that roll around in the lotion and on your skin. The handle has a hole in it for hanging on a hook. I have not tried cleaning it yet, but it does'nt look like that will be too much a problem unless the lotion dries out. Works great on my dry back in the hard-to-reach spots. Wouldn't live (happily) without it! I'm ordering my third one today. They don't last forever, but they probably last 6-7 years. I use mine every day. I liked the other comment that she keeps a spare in case they quit making them. I agree! I wouldn't want to be without one. I don't like getting my hands greasy, so I use it for my back, my arms, and my legs. I use this product to apply mosturizer and it reaches all the hard to reach areas. Easy to use, nice design and weight. I am buying this product for a second time it is SO useful. I use it to put lotion on my back as I can no longer do that otherwise. The grip is large and awkward for my smaller, arthritic hands; would work better for someone without either or both of those problems. It will work, and I do use it, just wish it had a different/softer/smaller grip. A couple of months ago, I bought two of these. One works perfectly, the other one keeps losing the roller balls. It also unscrews everytime I take off the guard. I love using the good one, but hate using the other one. However, I will order another one and hope it will be a "good" one! Gave this as a gift to a massage client of mine. She loves it for applying lotion. She was scratching her dry skin on her back as she was sleeping, now her skin is not bothering her at night. It came apart the first time I used it, so be sure you have the cap twisted on well. Works better than I thought it would. It could use a grip, as the handle has a tendency to slip out of your hand when in use. This works great, but the lotion has to be a thin kind because it plugs up if it is thick. It works great for awhile (maybe a long while), but then the little balls start falling out and here I am again...maybe the 4th time! Unfortunately, there is not another kind that lasts any longer than this one. This product is great for reaching areas of your back with lotion that would not be able to be reached normally. The lotion comes out at a nice even amount and the roller balls give a gentle massage while lotion is being distributed. I thought this product was a great idea, since I can't reach my itchy back, but after 4 months, it cracked. Not worth the money, but if they can redesign & make it stronger, it could be a best seller. THIS IS A WONDERFUL PRODUCT EXCEPT THAT AFTER A WHILE THE WHITE BEADS BECOME LOOSE AND FALL OUT. I FIND I HAVE TO REPLACE THIS ONCE A YEAR. I USE THIS DAILY AFTER MY SHOWER. It really does work. No more dry, itchy back. This device is perfect for moisturizing hard-to-reach areas of the back. However, the plastic is thin and cheap and breaks apart easily. If a sturdier one were available, I'd choose that one. really helps. Now I can reach my back by myself. One of the little balls fell out on the 2nd use, but was able to put back in. Not sure how long its gonna stay though.I put I would recommend to a friend but with warnings of the durability. handle durable, blue rollerball portion is flimsy breaks easily balls fall out. Combine this handle a rubber hand grip, extra large replaceable lotion pads of your pink handle applicator and you would have the PERFECT APPLICATION DEVICE! The design is good, but it breaks easily. This is the second one I've bought. This is a GREAT idea, especially for those whose reach is hampered. I bought one many years ago and it was great; unfortunately after those many years one of the little rollers fell out so I replaced it. Within months the little rollers started falling out (unlike the old one which lasted for years) and IT SCRATCHED! Going to try a new one but if it doesn't do better, will never order again. No sure is works. I can't feel the lotion on my skin eventho I put a lot of lotion inside the applicator. I have used this applicator only about 4 times and it is broken already and broke very easily i might add. It broke at the part that screws together and if it breaks completely ( which it looks like it will, I've tried to glue it) it will be no good. Too bad cause I've been wanting this thing for awhile now. Finally ordered it and now it's broken.I even bought one for a friend. I've bought two of these. They work great, until wear and tear cause the rollers to start falling out. I love the design, as I need to lotion my back daily, but I will not be buying another replacement. I am now on my second unit. Both units, after about one years use, loose the roller balls. I pick them up and put them back, both from the outside and the inside of the head. The next use, the rollers fall out again. It is very difficult to use with 4 to 7 rollers out of the applicator head. I use the applicator with body lotion for extra dry skin. I have reported this to Miles Kimble and have ordered a new applicator. Also I intend to write a letter to the company after the company calls me back with information on how to replace the rollers. I would recommend to others once the roller problem is corrected. It broke the very first time I tried it. The stick seems to be VERY weak. I didn't even get lotion out of the head of it. I actually would give it zero stars if the system let me but I am required to give at least one. This was given to me by a friend. I can see now why she didn't want it. The little beads fell out and the whole thing was useless. I threw it in the trash. Each time I try to use this another ball or two, falls out. The last time there were 9 of them which fell out as I tried to use it. Not worth the money. Worked great but didn't last. Puchased 3 and everyone cracked on the lotion holder rim. Had to throw them in the garbage. The little rollers keep falling out. I bought this product to apply lotion to my feet, which I cannot reach due to back issues. The product is hard plastic - it should be soft, as the plastic actually hurts. It does not dispense much lotion - just a very thin layer - not enough for my needs. My mistake in making the purchase. Be Careful! I tried this after a serious bout of shingles left neuralgia across my upper back. Felt good on my numb-but-itching skin until I saw what looked like cat claw scratches across my back! The ball rollers are plastic and mine have little seams on them, so they actually scratched my back as I used it. So be careful!!!! very unhappy with this item. do not like this item. lotion gets between the rollers and stays there. even after refiling, very little is applied. After just a few uses, the little balls started falling out. This sounded like a good idea as one could apply pain relief lotions,etc. to areas one can't reach. It was rather difficult and messy to put lotions in container and the plastic cover wasn't very secure. When tried to roll lotion onto area nothing really came out. Had to keep opening cover and spreading lotion over rollers. The plastic cover broke and then the handle broke. I used about 2 or 3 times. Only used twice and it broke,spilling lotion all over. I have bought 2 of these and both fell apart within 2 weeks, really wanted this to work but the plastic just splits and cracks. It does not apply enough cream on the rollers, it opened up more then once and I had cream all over the place. It does not screw on right, it just keeps turning and that is why it opens up. Bought one of these for my elderly mother years ago and it was great. The replacement that I just purchased was terrible. Every time you rolled it over a surface, half of the roller balls would fall out. You can pop them back in, but they just keep falling out every time you use it. And because it's an inexpensive item, I can't even return it because the postage would be more that the cost of the item. Don't order this. A wonderful concept for the single person with an itchy back. Unfortunately, mine broke on the first try...the dispenser may need to be deeper so the attachment can have a few more threads so it stays closed, otherwise the lotion squirts out. I wanted to try and see if this works to apply bath oil to my back. Purchased to apply lotion to my back. This product will help with hard to reach areas in my back. I need the aid in applying lotion & counting on this item to assist me. I thought it would help my itchy skin. To put lotion on my back. I have a reach problem because of a stroke. Live alone and can't reach my back. To apply lotion to hard to reach areas. I have used the lotion applicator for years and am purchasing this for my grandson's nanny. MY HUBBY HAS A HARD TIME PUTTING LOTION ON HIS BACK. I've used these for several years and they do a good job. Can't reach my back to apply lotioh -- hoping that this is a good solution and not a flimsy product. I already have one which works great for me; this one is for my sister. Bought this for my aunt so she doesn't have to rely on anyone to apply lotion to her legs and feet. Purchasing this for one of my aunts. She has trouble reaching the bottom of her legs and this is a way she can apply cream. I need help applying lotion bc I lack flexibility. I have one I use for aspercreme and I wanted this one for lotion. My daughter is disabled & this will be a big help with her putting lotion on. I bought two so I could have one as a backup when the other was being cleaned. These work very well. BEST ANSWER: There is no other style that I am aware of. This was all the catalogue offered.